This is a "Mandarin" style (Beijing/Sichuan) dish using hot chili, chili bean sauce, garlic and tomato sauce to stir-fry shrimp. The recipe was learned from the same reputable chef. The dish was another best seller in his restaurant. 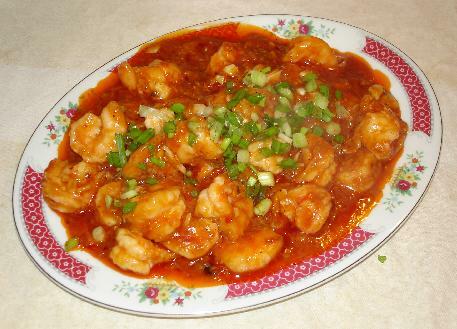 This dish may carry many names: Imperial Shrimp, Mandarin Shrimp, Peking Shrimp or other non-descriptive English names. The Chinese name: 乾燒蝦, which means dry-cooked shrimp, may be more meaningful. 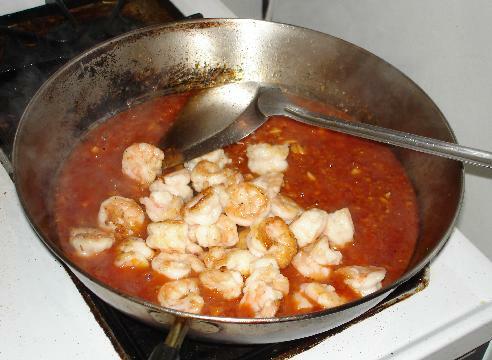 Main ingredients: Medium size shrimp (with shell), about 1 1/4 lb. Other ingredients include garlic, ginger, chili bean sauce, tomato sauce, chicken broth (not shown) and some seasonings (not shown). Shell each shrimp: trim off the head. Use your fingers to peel off the shell. 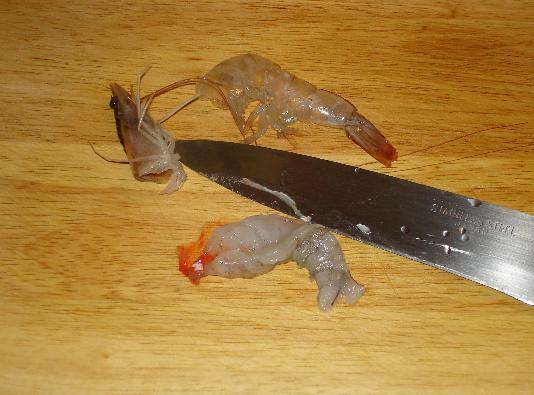 Use a chef knief or utility knief to make a cut about half-way through along the back of the shrimp. Devein. Rinse under running water. It is much easier to shell and devein the shrimp with a small utility knief under the running water with a bin underneath. You may save the shrimp heads and shells to make stock. I usually use them to make a stock, and add some miso paste and cubed tofu to make miso soup. Or add some Thai Tom Yum soup paste, a few pieces of shrimp and some sliced button mushrooms to make Thai style soup. 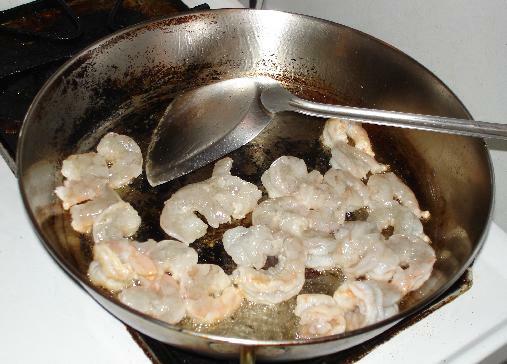 Marinate the shrimp: In general, seafood is very delicate. Do not use heavy sauces (such as soy sauce and oyster sauce) to marinate seafood. 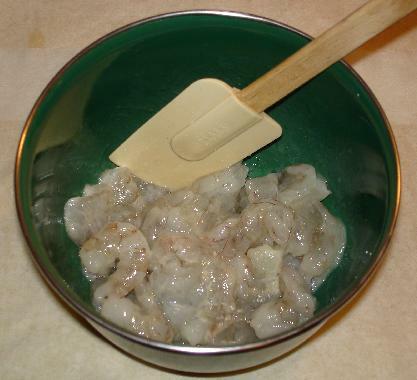 Add deshelled/deveined shrimp to a small mixing bowl. 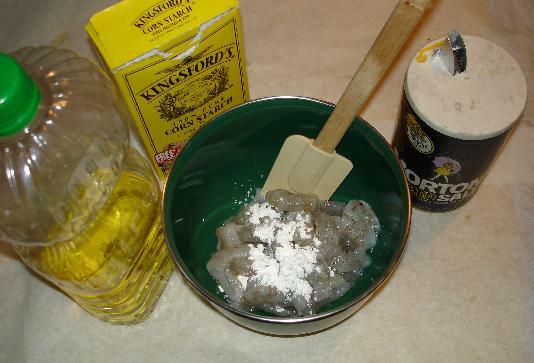 Add 1/4 tsp of salt, 2 tsp of cooking oil and 2 tsp of corn starch. Mix all ingredients well. Set aside for about 20 minutes before cooking. Meanwhile, prepare the aromatics. 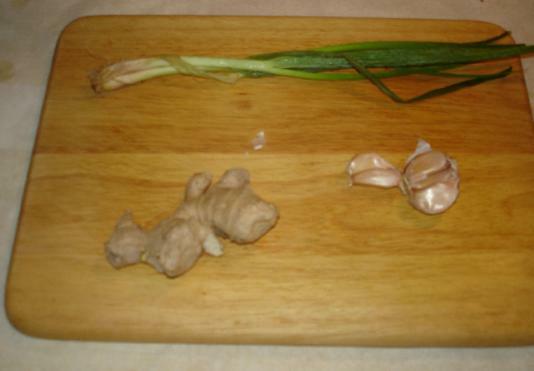 Use about a 1-inch cut of ginger, 4 to 5 cloves of garlic, and 1 to 2 stalks of green onion. Use a grater to grate the ginger. Peel and mince the garlic. Trim the ends of the green onions and finely chop. 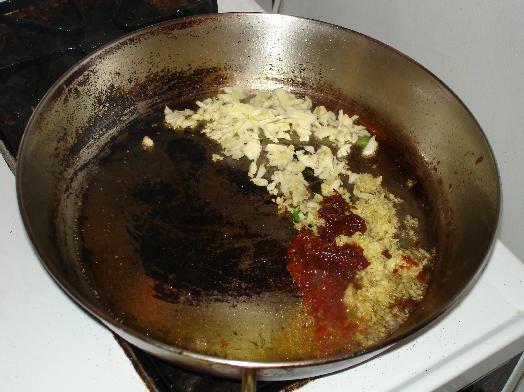 When ready to cook: use a wok/pan, set stove to high setting, add 3 tblsp of cooking oil. Wait until oil is hot, add the marinated shrimp. 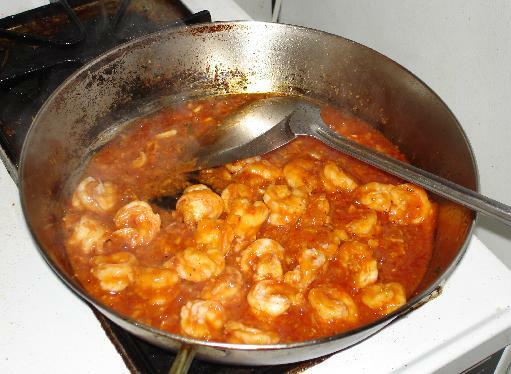 Cook until the color of shrimp turns from light grey to white and orange red, about 3 to 5 minutes. Remove from pan and drain. Discard the oil. 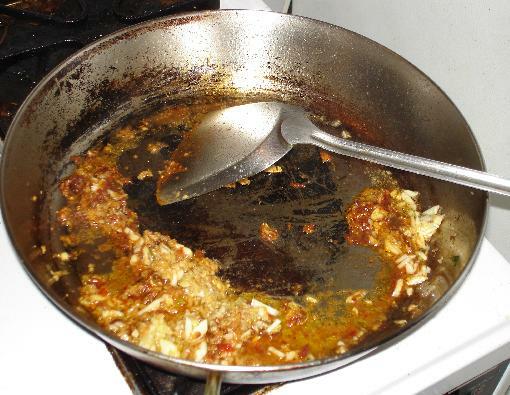 Use the same pan, maintain stove setting at high, add 2 tblsp of cooking oil. Wait until oil heats up and just starts fuming. 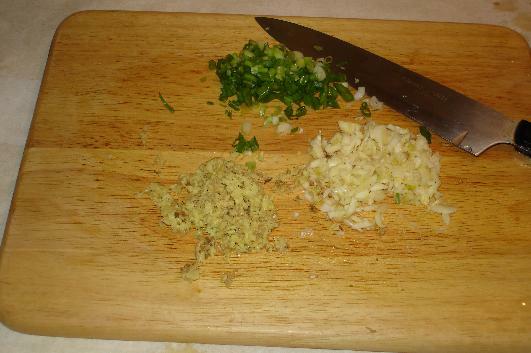 Add the shredded ginger and minced garlic. Add 1 to 1.5 tsp of chili bean sauce. Add 1 tsp of chili sauce. (Note: if you like hot and spicy food, you may add more chili sauce to taste.) No need to add extra salt because the chili bean sauce is very salty and the shrimp has already been salted. Stir well. Cook for about 15 seconds. Dash in 2 tsp of white vinegar and 1 tsp of Shao Hsing cooking wine. 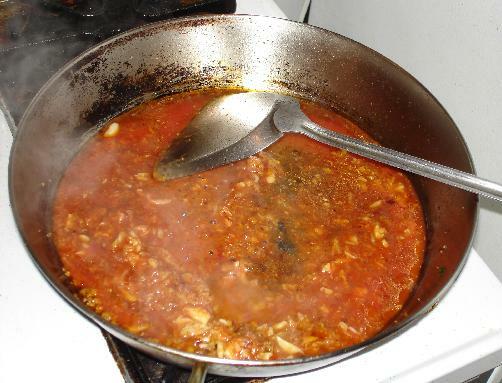 Add 1/4 cup of chicken broth, 1/2 can (small 8-oz can) of tomato sauce, and 3 tsp of sugar. Stir well. Bring the mixture to a boil. Use a small amount of corn starch slurry (suggest: 1/2 tsp corn starch dissolved in 2 tsp of water) to thicken the sauce to the right consistency. Re-add the pre-cooked shrimp. Stir well. Continue to cook for 1 to 2 minutes until shrimp is reheated. Finished. Transfer to the dinner plate. Add the chopped green onions on top to add flavor and to serve as a garnish. awesome! I love this dish. I used some of your techniques for a stir-fry tonight with variations. It came out pretty well. Thanks again for taking the time and putting in the effort to do this. These pictorials are so amazing. Thank you, hzrt8w! I have yet to try any of the dishes, but with the weather what it is now, it should be a good weekend to stay home and cook. I'll have to give this one a try. Well, the Chili Udang Galah (kind of like big langoustines, also called lobster shrimp and such-like) that I used to get at the "home cooking" Chinese restaurant in Kuala Terengganu, Malaysia, used shrimp with the shells and head on, so that's just another way to do things. When are you going to invite me to your house, Ah Leung? hzrt - another great one! I wonder why it is called 'gan' when it is fairly saucy. Would you show what your ginger grater looks like? One last thing. When you do your book, you will be showing not only that you don't have tomuse a wok to do fantastic Chinese food, but you don't need a big cleaver either! 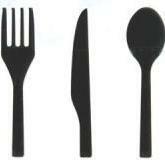 Conventional tools -- fantabulous food! Thank you all for your support! And Michael: My kitchen door will always be open for you! 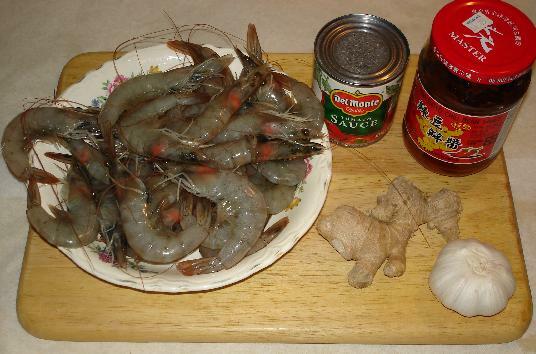 Anna: I agree that the "authentic" Chinese way would probably leave the shell and heads on when cooking shrimp. They cook this dish with the shells on in China. But in the USA, all the restaurants I had been to ordering this dish made it with deshelled shrimp. You may certainly cook it with the shell/head on. Just skip the marination step. No need to marinate the shell! .....Would you show what your ginger grater looks like? .....One last thing. When you do your book, you will be showing not only that you don't have tomuse a wok to do fantastic Chinese food, but you don't need a big cleaver either! Conventional tools -- fantabulous food! jo-mel: I think it is called "gan" because the shrimp is the main and "only" ingredient, not cooked with any vegetable or anything else. I may be off on this. The grater that I use is an old-fashioned, "one facet" cheese grater with 2 blade/hole sizes. I use the 1/8-inch blades/holes to grate ginger. I don't like using the 4-facet cheese graters. They don't work too well for me. A wok and a cleaver have long been associated with traditional Chinese cooking. I have a feeling that if I ever find a publisher to print my cookbook, he/she will demand that I demonstrate all cutting techniques with a cleaver and cook everything on a wok! For showmanship sake. If you unshell the shrimp to cook this dish: You may save the shrimp heads and shells to make stock. I usually use them to make a stock, and add some miso paste and cubed tofu to make miso soup. Or add some Thai Tom Yum soup paste, a few pieces of shrimp and some sliced button mushrooms to make Thai style soup. If you peel the shrimp to cook this dish: You may save the shrimp heads and shells to make stock. I usually use them to make a stock, and add some miso paste and cubed tofu to make miso soup. Or add some Thai Tom Yum soup paste, a few pieces of shrimp and some sliced button mushrooms to make Thai style soup. This dish is very popular in many types of Restaurants in Hong Kong. In order to make ours taste better we would take a batch of Shrimp Heads, Bodies and all the trimming accumulated and heat up some oil in a large Wok and stir fry them all until they changed colors and started to get Red, after covering them put into the hot pan a cup of Shao Hsing Wine letting it boil together until the steam quieted down, then strain the oil and discard the Shrimp Shells [to our waiting staff] and glaze the hot pan bottom with some supreme stock letting it cook down and put into a container after mixing it with some Tomato Paste to use as a Shrimp/Tomato Base by adding several spoonfuls to every order about 30/40 seconds before it was served to customers. If we had lots of Crab Shells they would be Incorporated as well into the base after being prepared the same way. In our European Style, American Restaurants we would save all our shrimp and prawn shells and heads to incorporate into a base for dishes like Shrimp Scampi by preparing the shells in the same style using Chablis then reducing the base and adding it to a Chicken/Pork Glacé de Villande again adding a spoonful to every order of Scampi just before serving to customers. This works very well at home or in any Restaurant serving these types of menu items. Ma used to prepare this dish using unpeeled larger shrimps. She also kept the heads. I made this dish several times using crayfish/crawfish/crawdad' (if yaw from the South). That's the same grater I use. And I don't bother to peel the ginger. I use that same guage grater for garlic, too, ----when I want a fine mince. I don't peel the garlic. I just pick off the tip with my fingernails and grate away. One of my cleavers is very narrow - about 1 1/2 inches across a regular length blade. I use it alot for light stuff. If a publisher starts in on you, just tell him not to question a Master Chef!! Another winner, hzrt8w!. One small request, though: When you show the bottles of ingredients, would you please turn the bottles so the English description/name is showing to the camera? Some jars of imported Chinese ingredients seem to have Chinese on one side and English on the other. Thanks again, and don't stop! ...One small request, though: When you show the bottles of ingredients, would you please turn the bottles so the English description/name is showing to the camera? Thanks, Jay! Sure, you got it! I will do that going forward. Thanks for pointing it out. The Chinese side of my brain typically won over the English side. Many things to improve on these pictures. Yeah, I was going to mention about it too. Some put chopped onions to make this dish. It brings out the taste by a notch. I notice you made a lot of sauce ("jup") with the dish. Well, a lot to me. That means you must cook a lot of rice to use up the sauce, ehh? Not necessarily rice....toast is great for soaking up all that jup, especially, shellfish jup. Or deep-fried mantou. I use ketchup instead of tomato paste. It comes out tasting a little sweeter. Oh my, this dish is fantastic! Even though I'm in the midwest (and don't think there is anywhere in the city to get such flavorful shrimp with heads on), was able to make this and it came out super tasty. None of the ingredients are difficult to find and it was so easy. I'm now ready for an apprenticeship in a good Chinese restaurant. Thanks, Ah Leung, for sharing this really great recipe, I'll be making it often!